This is a very exciting update for me, I am hosting a video of the treehouses being built at Walt Disney World! These units replace the old treehouses, and are in various stages of being finished. Denise from MouseSteps shot this video today (as well as another treehouse video HERE), and she also has many photos on her update! 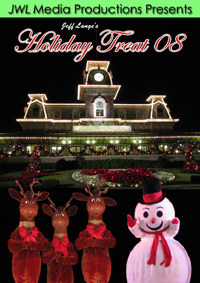 This all-new JeffLangeDVD title features the 2008 Mickey’s Very Merry Christmas Party including: Cinderella’s Holiday Wish, Mickey’s Once Upon A Christmastime Parade, Holiday Wishes – Celebrate the Spirit of the Season, the ’Celebrate the Season’ show, cookie and hot chocolate stations and much more!